Embark on a frozen adventure in the 40-payline Crystal Kingdom slot machine online from IGT slots and H5G! This new world is a fascinating place where prizes are hiding behind symbols like polar bears, queens, kings, and other symbols waiting for you to discover them. Embark on a frozen adventure in the 40-payline Crystal Kingdom slot machine online from IGT slots and H5G! This new world is a fascinating place where prizes are hiding behind symbols like polar bears, queens, kings, and other symbols waiting for you to discover them. With its gold and blue background, its a slot built for royalty which is what you feel like when you start winning with popular features like Tumbling Reels, Wilds and Free Spins! The slot is beautifully created with a frozen background behind the reels where you can see slightly a castle rising from the ice. In fact, the whole game almost reminds us of an adult version of Disney’s 2013 Frozen film. Unlike the popular theme song from the film though, you won’t want to “Let it Go” in this game… it’s too damn fun! Chilling Wilds – The game’s logo is the Wild symbol will substitute for all other symbols except the Free Games symbol to complete winning combinations when possible. Additionally, the Wild will substitute as two Queens, Kings or Polar Bears if possible. The symbol appears on reels 2, 3 and 4 only. 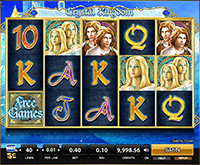 Free Games – To win free games, you’ll need to land three “Free Games” symbols in any position on the reels. You’ll then win between 6 and 16 Free games! These symbols appear on reels 1, 2 and 3 only. Tumbling Reels Feature – A favorite among players, the Tumbling Reels feature allows extra wins on top of your wins. After your initial win is awarded, all symbols in the winning combination disappear and the empty positions on each reel are filled as symbols tumble down from above. This could create a real avalanche of winnings!